The federal government is spending $117 million to help facilitate the deal to sell and begin repairs to the flood-damaged rail line to Churchill. 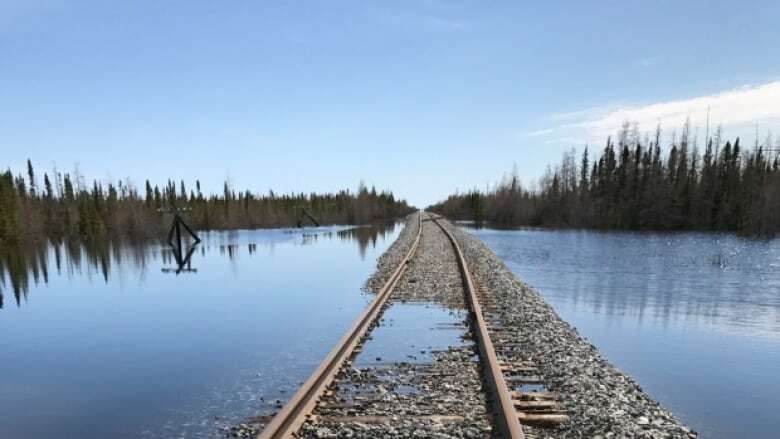 The federal government is spending $117 million to help facilitate the deal to sell and begin repairs to the flood-damaged rail line to the northern Manitoba town of Churchill. The deal, which sees Denver-based Omnitrax Inc. sell the railway, a marine fuel tank farm and the Port of Churchill to Arctic Gateway Group, was announced Aug. 31. On Friday, Ottawa revealed details of its investment. "We committed to find a solution to restore the Hudson Bay Rail line and we delivered," said Manitoba MP Jim Carr, minister of international trade diversification. "I am happy to say that repairs have begun and all efforts will be made to restore service before winter freeze-up. "This collaboration has historic significance and we are excited to see the success the future will bring." Assembly of Manitoba Chiefs Grand Chief Arlen Dumas was part of negotiations from early days and sees First Nations partnerships as a major step forward. "To allow us to take the opportunity for true reconciliation. Gone are the days of beads and trinkets," Dumas said at the announcement. Of the announced funding, $74 million will be spent over the next three years to help cover the costs of buying and repairing the line and the port. The remaining $43 million will be spent over 10 years to pay for operations and to enhance the commercial viability of the line, the port and the tank farm. Ottawa also provided an additional $10 million as a repayable contribution to provide time for Arctic Gateway Group — a private-public partnership that includes Missinippi Rail Limited Partnership, Fairfax Financial Holdings and AGT Foods — to secure a loan for the sale. Under terms of the arrangement, Arctic Gateway Group will not be providing dividends for at least 10 years, according to a release from the the federal government. The money is coming through the Western Diversification Program of Western Economic Diversification Canada. Executives from Fairfax Financial Holdings and AGT Food and Ingredients did not provide details of the investment they've made in the deal. AGT chief executive officer Murad Al-Katib told reporters the new business partners are making capital contributions and will secure commercial financing as well. Paul Rivett, the president of Fairfax Financial Holdings, expressed a mix of surprise the port has been so under-utilized in the past and optimism in his company's investment. "The Russians, the Chinese, they are all up there. And so, for reasons of sovereignty, for reasons of economic development, community development, we take a long term view and we are going to build something fantastic. It is North America's only rail-linked Arctic port. It's amazing to me that it hasn't been developed more," Rivet said. Churchill, a community of roughly 900 people and Canada's only deep-water Arctic port, 1,000 kilometres north of Winnipeg, has been without a land route since the railway was damaged by flooding in May 2017. The line also connects nearly 30,000 people from First Nations and other communities along the line, as well as the Kivalliq region of Nunavut. The closure of the rail line drove up costs for fuel and food, which had to be brought in to Churchill by air or ship. The deal's consummation is a particular relief for Churchill Mayor Mike Spence, who played a major role behind the scene in the deal. Spence co-chaired the One North group of northern communities along with Onekanew (Chief) Christian Sinclair of Opaskwayak Cree Nation. For more than a year, Spence bore the brunt of concerns from Churchill residents over the slow pace of negotiations. "There was so much stress, so much stress. We woke up with stress and we went to bed with stress. But the fact of the matter is, we stood united and we accomplished what we intended to do," Spence said. The negotiations for the purchase of Omnitrax's Manitoba assets, including a rail yard in The Pas and a marine fuel tank farm in Churchill, along with the rail line and port, had been going on for months. The federal government said Friday repairs to the line have begun and crews are working seven days a week in the hope of restoring rail service before winter. Notably absent from such a major announcement was any political representation from the provincial government. Premier Brian Pallister maintained throughout the long efforts to restore rail service to the north that it was the responsibility of the federal government. Pallister, Indigenous and Northern Relations Minister Eileen Clarke and Municipal Relations Minister Jeff Wharton were in Neepawa to announce tax support for a feed mill Friday morning.